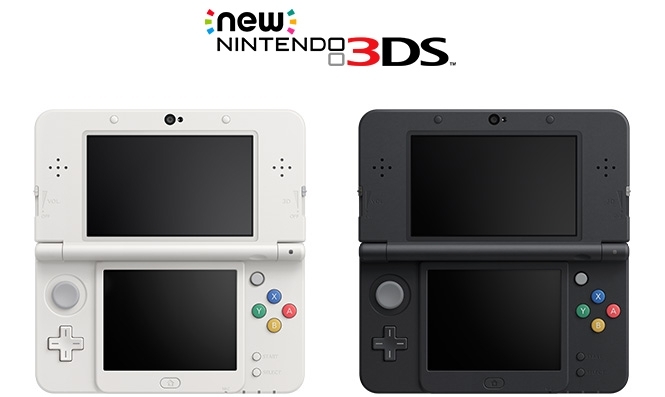 Nintendo on Friday announced plans to launch two revised 3DS handheld consoles later this year. The systems, known simply as the New Nintendo 3DS and New Nintendo 3DS XL, both feature a new small analog stick (more of a nub really) that Nintendo is calling the C-Stick (likely to manipulate the camera in supported games). Nintendo has also added a pair of shoulder buttons on the top of the system, ZR and ZL, which join the existing R and L bumpers. Super Nintendo-themed A, B, X, Y buttons can be found on the New 3DS which is a neat throwback for old school gamers. Under the hood is a stronger CPU and built-in NFC support for Nintendo's upcoming Amiibo figurines. Existing models will also be able to use said toy line thanks to an upcoming NFC adapter, we're told. Nintendo didn't provide much information about the new processor although it probably lends a hand in powering the new "Super-Stable 3D" functionality which claims to provide players with an even more comfortable 3D gaming experience. Elsewhere, the new systems will allow users to install custom covers to keep their systems protected from the elements. The reveal came during a Japanese Nintendo Direct video briefing in which we were told to expect the new systems on October 11. Unfortunately, Nintendo is only releasing the handhelds in Japan for now with no US or European launches this calendar year. Pricing is set at 16,000 yen ($153.79) for the New 3DS and 18,800 yen ($180.70) for the larger XL model.